Night Stand HD is a stylish clock app that today launched as a iOS universal app, with version 1.5 offering nine clocks, an alarm that runs in the background with iOS 4.0+, and weather info. The app comes in a free “lite” edition as well as a $4.99 paid edition and supports Retina displays. 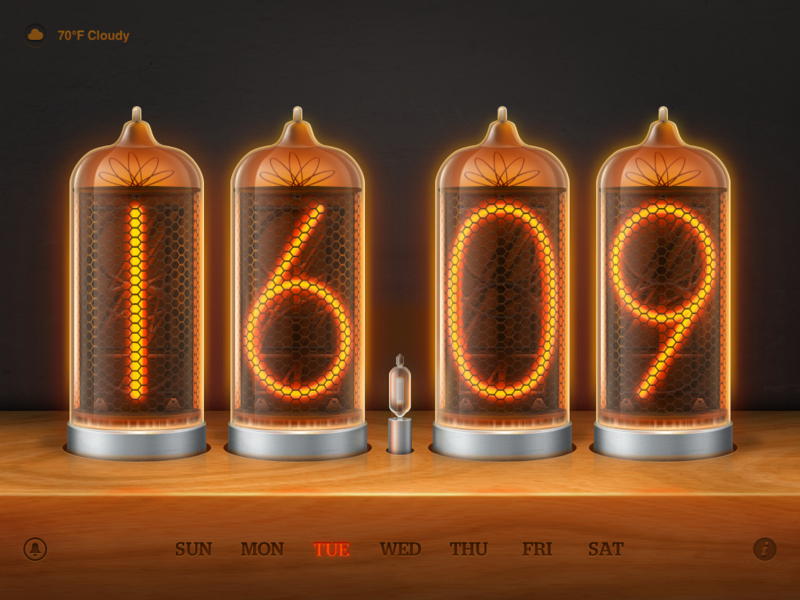 Love it: Stylish clock designs including a “Binary Clock” a color-changing analog clock and the very unique Nixie clock. Hate it: Weather and clock locations are limited. $4.99 seems a bit much for the paid version. Night Stand HD – especially on the iPad which is the version we tested – is certainly pretty to look at, and that is probably the most telling part of any clock app. The app offers enough clock settings to probably satisfy most users, with the options of showing seconds, days, and 24-hour time. The nine different clocks – two of which are new in this version, with the unique and somewhat strange Nixie clock only available on the iPad. The very cool stopwatch included in this version is also excellent, and can track up to 99 laps. The app rotates nicely on the iPad and developer SpoonJuice has certainly put a lot of effort into making this a very attractive app – we had no problem just leaving the app open on our desk for a few hours as a cool desk clock. That said, our 3.5 rating is there mostly for two reasons: the price of the paid app and the lack of more city options for both weather and clocks. For instance, we put in both Worcester, Massachusetts, Arlington, Texas and Wuhan, China, and none of them showed up as options for setting either the world clocks or the weather. We’re assuming these are on the same database, so hopefully that can just be upgraded in the next version. Also, while we applaud all developers that offer a lite app, for many users, we suspect that they won’t be too inclined to pay $4.99 for – though visually striking – is still just more or less a clock.